I don’t think I’m going to have enough photos to justify explaining what I had to do to make this quarter panel. I will try to do some sort of explanation and then photos will have to tell the rest. As you can see the quarter panel was pretty crunched. Right inside the quarter panel is a gas tank. This gas tank split open and I can only say it was very fortunate that a fire didn’t occur. 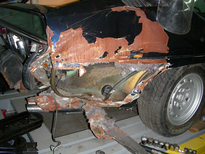 Let me just say that structurally the unibody had to be pulled back into proper alignment 1st. 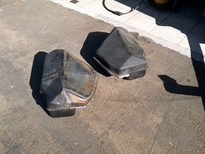 I cut enough metal away so that I could remove the gas tank. I also repaired the gas tank. I was fortunate to have the series 1 at the shop. I used it's right quarter panel as a pattern by bending a thin wire to define the corner. I had to break the project down as to how many pieces I had to make. I basically used an English wheel and a bead roller for most of the work. Four pieces where needed to put her back into shape. I needed to make a corner, a rear lower quarter panel, a rear upper panel and part of the rear body panel where the exhaust outlet is located. 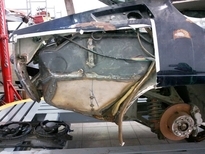 The rear lower panel has several creases and needed the most attention. Using a lathe to make a pattern for the bead roller I incorporated the lower angle, upper angle (which are different) and the indent for the body side molding. I have photos of the reproduction moldings in a separate photo group. To maintain the proper shape while welding the panels together, I needed to incorporate a support…with the support I was able to install screws to hold everything together while welding. 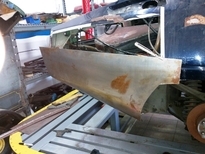 After welding the pieces together, the support was removed and the holes were welded closed. It was a great relief when I removed the support and nothing moved! Anyway, this is getting very long-winded. Before photo of the right gas tank. Repaired gas tank been test fitted. Temporary curved support being fitted. Showing the damaged piece in the original location. A little further along still test fitting. 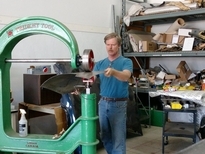 Metal is placed on top of a wooden form. The metal and is folded over wire. Applying the proper curved shape to the exhaust outlet. The small gauge comes in handy to track your progress. The old next to the new. Not a pretty picture supporting the new piece. This is the 2nd and final version. This was the 1st version. This is a good view of what's actually occurring to the metal. Here are the individual pieces. Starting to put down the bead on the Lamborghini Espada. This photos of little distorted it gives you an idea. You can never tested enough. It's finally starting to look like a car. By this time the Espada series 3 had rear marker lamps. This was a great day a hold up that panel. You can see the temporary support running down the middle. Screws are securing the lower panel into position.